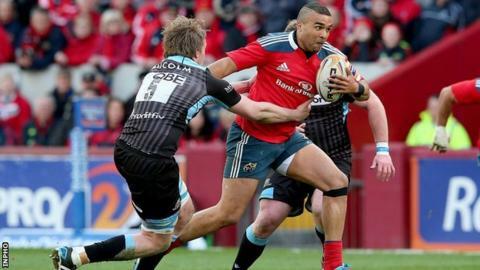 Glasgow boosted their hopes of securing a Pro12 semi-final play-off place by overcoming Munster at Thomond Park. Jonny Gray, Sean Maitland and Josh Strauss crossed the line for Glasgow in the first half, with Duncan Weir adding a penalty and two conversions. CJ Stander scored Munster's only points of the game with a first-half try. The victory moves the Warriors up to fourth in the table, three points behind third-placed Munster with a match in hand over the Irish province. The success represented the first win by a Scottish team at Munster's Limerick fortress for six years as Gregor Townsend's men made it four Pro12 wins on the trot. In contrast, it was a first home defeat of the season for Rob Penney's much-changed side, ending a 13-match unbeaten streak. Second row Gray shrugged off a couple of attempted tackles and drove over under the posts after just four minutes, fly-half Weir adding the simple conversion. A Weir penalty extended his side's advantage, but Stander completed a fine move along the Munster back line, involving Simon Zebo, Keith Earls and James Downey, by touching down to the right of the posts in the 18th minute. JJ Hanrahan totally mis-kicked his conversion attempt. Scotland international Maitland grabbed his side's second try after 25 minutes when he got the better of Lions team-mate Zebo to score but Weir missed the difficult conversion kick from near the right touchline. Munster missed a gilt-edged chance to reply as Stander, having intercepted a pass, opted to kick ahead instead of offload the ball with Gerhard van den Heever on his shoulder. A Strauss try four minutes before the interval, converted by Weir, saw the visitors go in 17 points to the good at half-time. The Munster defence was out-muscled again as, having been held up close to the posts, the Scots set up man-of-the-match Strauss to reach over past the covering Earls. Munster almost fell further behind in the 49th minute as Ryan Wilson was inches away from a bonus point score - Zebo and Downey combined to deny him. Defences were on top in the third quarter with Munster failing to convert scrum pressure into points, and they continued to play below par, emerging scoreless from a succession of visits to the Glasgow 22. The province's execution let them down as they failed to shake off their European hangover, allowing Glasgow to celebrate a fourth victory in their last six trips to Ireland. Glasgow entertain second-placed Ulster next weekend, while Heineken Cup semi-finalists Munster travel to the Sportsground in Galway to face Irish interprovincial rivals Connacht. Munster: Felix Jones, Gerhard van den Heever, Keith Earls, James Downey, Simon Zebo, JJ Hanrahan, Conor Murray, John Ryan, Duncan Casey, BJ Botha, Donncha O'Callaghan, Dave Foley, CJ Stander, Sean Dougall, James Coughlan (capt). Replacements: Quentin MacDonald, Dave Kilcoyne, Alan Cotter, Billy Holland, Paddy Butler, Duncan Williams, Ian Keatley, Johne Murphy. Glasgow Warriors: Peter Murchie, Sean Maitland, Alex Dunbar, Finn Russell, Tommy Seymour, Duncan Weir, Chris Cusiter (capt), Gordon Reid, Dougie Hall, Jon Welsh, Tim Swinson, Jonny Gray, Josh Strauss, Chris Fusaro, Ryan Wilson. Replacements: Pat MacArthur, Jerry Yanuyanutawa, Geoff Cross, Leone Nakarawa, Rob Harley, Henry Pyrgos, Peter Horne, Richie Vernon.